Sustainable Farming Keeps Small Farmers on the Land | Small Farmers. Big Change. Armando Sonnco wanted to leave farming for mining because he felt that he could no longer support his family with his coffee farming income. At the same time that Armando was considering leaving farming behind, two of the cuppers (quality control technicians) from CECOVASA (The Organization of Agrarian Coffee Cooperatives of the Sandia Valleys) had given a sample of his coffee to us at the Equal Exchange lab during a visit to Boston this past spring. Beth Ann and Mike liked this coffee so much that we decided to buy it as a microlot. Luckily, before making a final decision to leave farming for mining, Armando called up the head field extensionist for his production zone, Vinicio Sucaticona. He told Vinicio that he was thinking of leaving his coffee farm for nearby amateur mining projects but Vinicio told him the news that Equal Exchange had bought his coffee due to its amazing results on our cupping table. Inspired by the news, Armando decided to give farming another chance.This year, however, he wanted to try something different and really invest in his farm and crop in an attempt to be as successful as possible. He started calling Vinicio every week to discuss the best on-farm practices and ask his advice in renovating certain areas of his farm. This past August, I had the opportunity to travel to visit Armando’s farm above the village of Belén. It was my final day after a long trip and Armando’s farm is located straight up the side of a mountain at an altitude of 2050 meters above sea level (or 6725 feet). I looked up the extremely steep path that led to Armando’s house and wondered how wobbly my legs would be on the way back down. After about 40 minutes of hiking, we reached Armando’s house. I quickly learned from him that I was the first buyer who had ever visited his farm. I told him that it was my first solo trip as a buyer for Equal Exchange. After hearing his story about wanting to leave farming and then coming back to it because we were able to present an economically viable supply chain, it felt like the perfect ending to the trip. It also illuminates the incredible amount of work that remains for all of the actors along the supply chain. 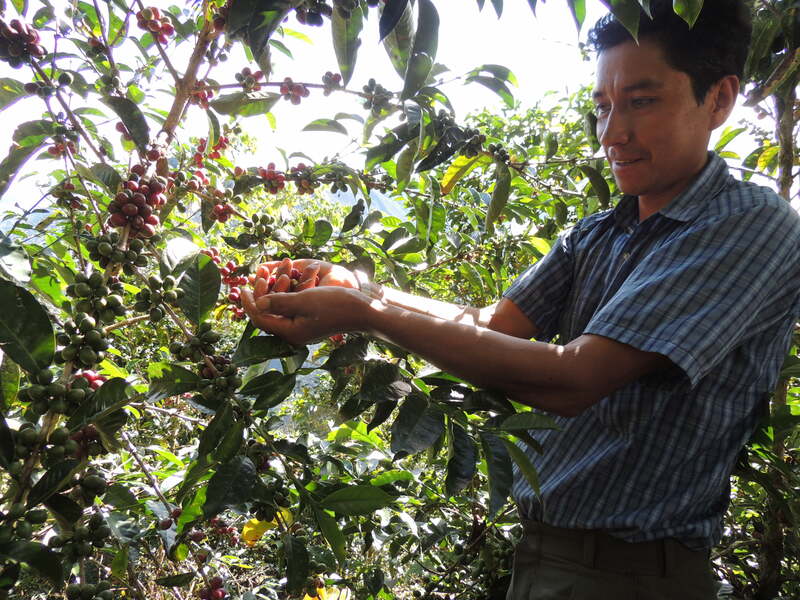 This year we were able to buy Armando’s microlot, and in turn, he continues to farm. It’s a poignant story, and yet, there are many other cases where farmers end up making the incredibly difficult decision of leaving farming in order pursue the boom industry of the day. Stories like this one really illustrate the potential of and continuing need to grow alternative trade systems. Mining is an activity that has a deeply negative impact on the natural resources of an area: trees and ecosystems are interrupted dramatically and permanently, thereby altering food and hydrological systems that all local communities rely on; and perhaps most importantly, an element is permanently removed from the land therefore devaluing it over time. The other major issue of mining versus sustainable farming is that once an area has been mined, that land does not have the same value and parents do not have a sustainable gift to leave to their children. In contrast, someone like Armando, who has three daughters, farms his land organically and invests in the long term health of the soil, the surrounding forest, and the health of the plants: he has something very valuable and sustainable to pass to the next generation. In rural areas like the Sandia Valley of Peru in the southern Andean range, farming and environmental stewardship are the opportunity for staying connected to your community, culture, and family. We consider this an extremely important fact and this is one of the many reasons why I believe that we must continue to work on developing trade networks and supply chains that value the work of small landholders. The reasons for supporting our small farmer supply chain are abundant and diverse. Visiting farmers and hearing their stories about why our trade relationship is important to them remains the single most important part of my job—it reminds me every day that individual farmers who support their families by working the land are the very reason why we have a supply chain in the first place. 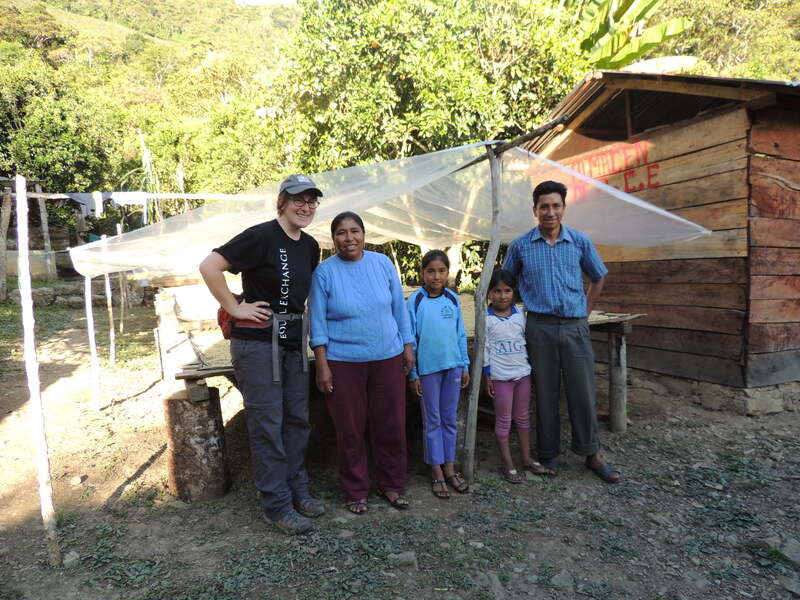 With Armando’s family in front of his drying beds.